The bread. Are you spellbound yet? 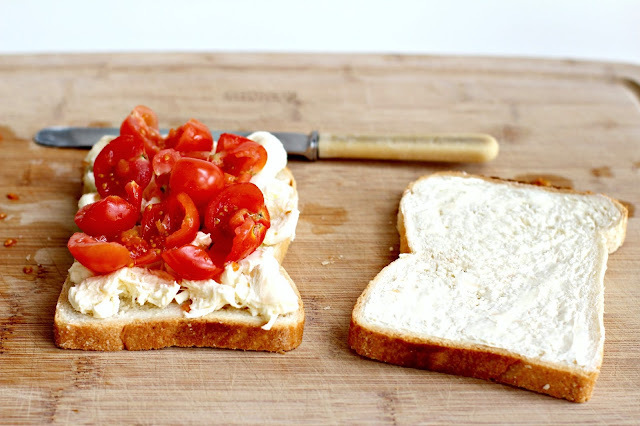 Top with torn mozzarella and squashed cherry tomatoes. I don't know what made me so violent with my food today. Fry until golden and the cheese is metly. Here's another shot just in case you didn't catch that. I know it's not exactly tomato and basil season here at the moment (she said listening to the wind howl outside and pulling a quilt over her knees), but I just had to get my Caprese fix. I'm thinking you guys would totally understand if I sat next to a crackling fire with my fluffy slippers on eating a hot, buttery sandwich full of summers finest offerings... that's why we're friends. Generously butter the four slices of bread right to the edges. Turn them over so that the unbuttered side is facing up. 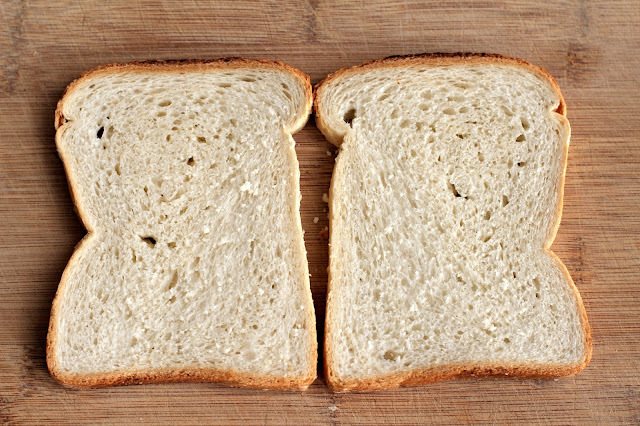 Set two slices aside. 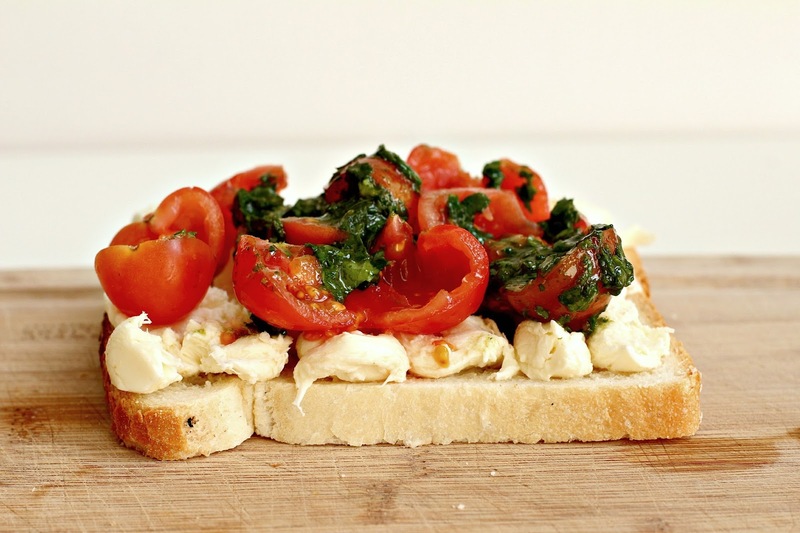 Tear up the bocconcini and place pieces on the unbuttered side of two slices of bread. Gently crush the cherry tomatoes, letting some of the seeds and liquid come out and discard the seeds and liquid. 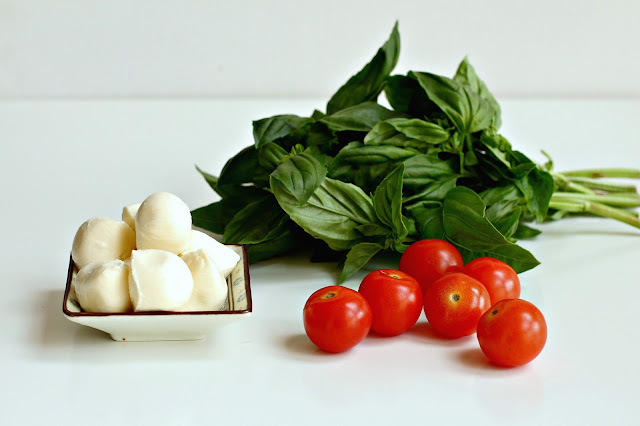 Put the squashed cherry tomato flesh on top of the mozzarella. Place the basil leaves, salt and oil in a blender and blitz. Pour the basil oil over the tomatoes. You probably won't use all the basil oil for these two sandwiches, but it's great in pasta and soups or anywhere you would use fresh basil. 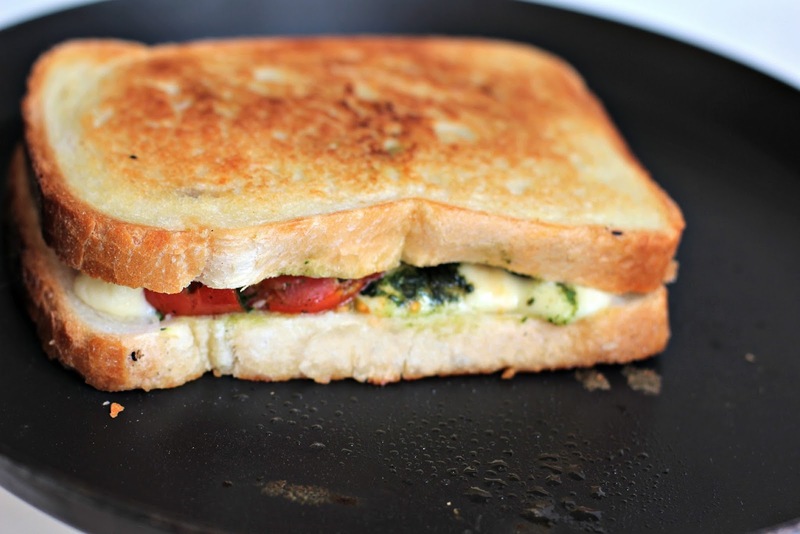 Place the reserved slices of bread on top of the mozzarella/tomato/basil combo, buttered side out. Heat a large frying pan over medium heat and place the sandwiches in. Fry until golden and the cheese is starting to melt. Turn the sandwich over and fry until the other side is golden. And yes, I just told you how to make a sandwich. This is a gorgeous sandwich seriously! I am dreaming about it now! Thanks so much - tomatoes, basil and mozzarella, it's a dreamy combination. Loving this. One of my best comfort foods! Thanks Patty. You must be in tomato season now... lucky you. 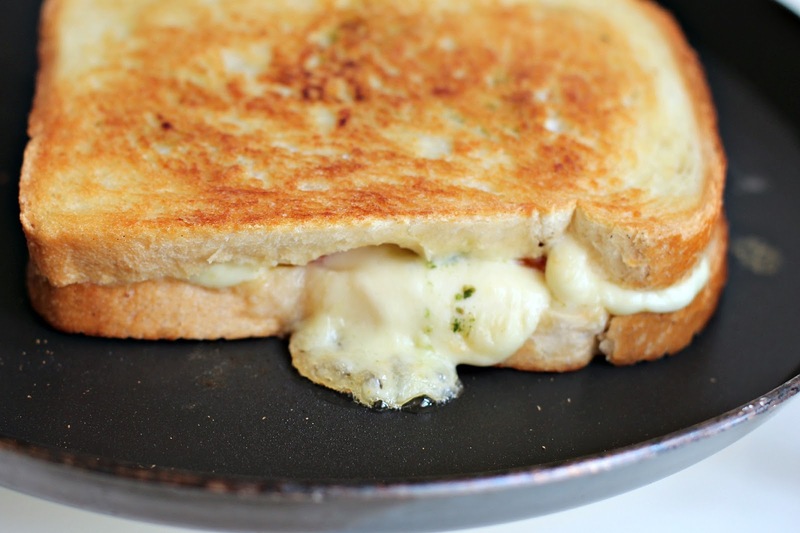 Goodbye plain and boring grilled cheese!!! 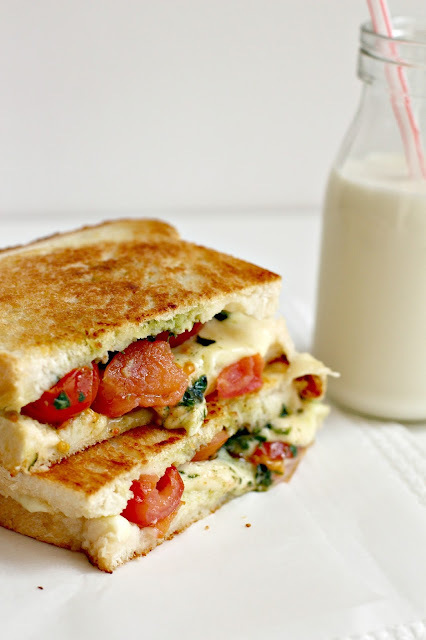 I'm always looking for ways to make grilled cheese more exciting-I love this idea! Thanks Dawn. 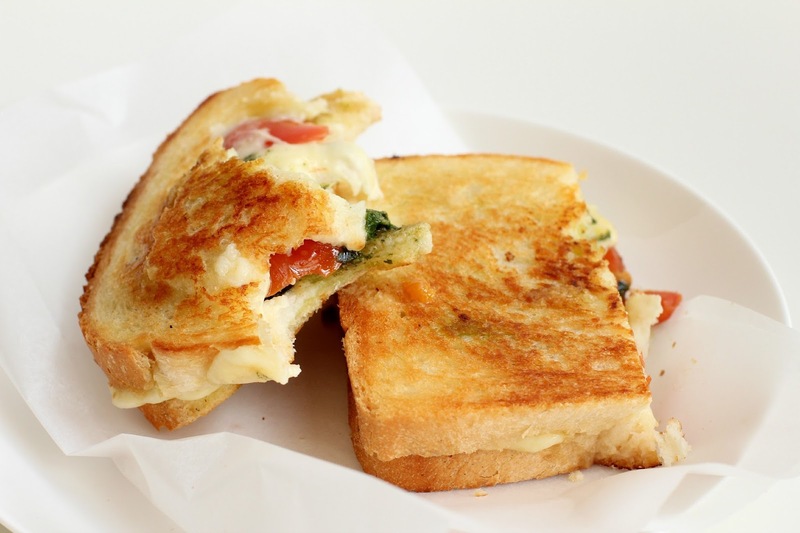 I love grilled cheese, but grilled cheese with tomato and basil oil, that floats my boat. I completely, totally understand. This gorgeous sandwich begs to be eaten anytime! Extra delicious I bet in front of a fire and with fuzzy slippers. I knew you'd understand Maria. Oh sooooo good! I'm with ya on that Caprese addiction. Yup. I'm a hopeless case. Me neither. Bring. It. On. Yum! Such a delicious looking sandwich with some of my favourite things. Hey Emma. Can't really go wrong with these ingredients, right? This is one yummy looking caprese sandwich. 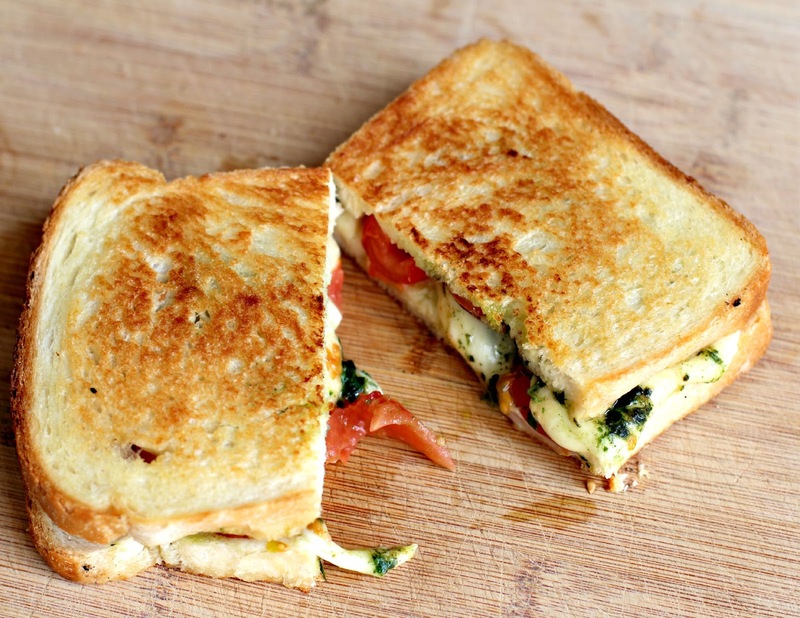 So much better than a plain old grilled cheese. Thanks Dawn. If I'm going to be bothered to make a grilled cheese sandwich, it's only a hop, step and jump (and some tomatoes and basil) and I'm in Capri. Looks like heaven between two slices, my favorite type of sandwich! Bring it! I just got a new panini press and have been looking for the perfect sandwich to make in it, I think this just might be the one! This is going to be great in your new toy, I mean kitchen gadget!